In the previous chapters, the focus was on moving from the outpost towards the center. Once you’re at your center then you begin to be more consciously connected to your Higher Self. As a result you already feel much lighter and experience more joy, happiness and effortlessness. 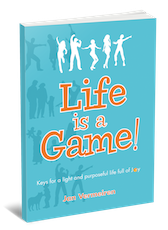 In this chapter we will look at how you can attract more situations, people and things in your life that you enjoy. By attracting those things and people you will feel even better. It’s actually not really necessary to have, do or be more to feel great (like we will see in Chapter 6), but since we are living as Human Forms in an experience based environment, we do enjoy the interactions with the world. So let’s see how we can attract what we want. You probably have already heard of the “Law of Attraction.” Apparently, the term was introduced in The Teachings of Abraham (Esther and Jerry Hicks). Later on it was adopted by many other teachers and authors and popularized in the movie, The Secret. The Law of Attraction is a concept I have been using in my life for a while now. For example, it helped to turn my books Let’s Connect! and How to REALLY use LinkedIn into international best sellers. And at the same time I felt that I was missing some pieces of the puzzle because the results were not consistent and I didn’t feel fulfilled. Inconsistent results brought me to a deeper examination of the different aspects of the Law of Attraction as I searched for the missing pieces. I will share those with you in this part of the book. In the meantime, I also found out that the reason I didn’t feel fulfilled was that I was not aware of the game I was playing. I was still playing the Phase 1 game instead of the Joyful Game of Life. When you are still in the Phase 1 game, no results will really satisfy you. Whatever you get, whatever you achieve, you still will feel that there is something missing. Finding satisfaction can be another thing to strive for. But when you have achieved that, after a period of satisfaction, something starts nagging again. In Phase 1 of the human game you can never be never satisfied. And besides that, the more material possessions you collect, the more stuff the wicked warriors feel they need to protect. The more stuff you have, the more there is to be worried about, and the more stress is generated as your warriors need to watch over everything to make sure it is not attacked, damaged or stolen. It is only when we are consciously connected to our Higher Self that we can feel the Peace we are so frantically looking for in Phase 1 of the human game. We then start doing less and being more, with peace and quiet as a result. And at the same time, when we are connected, we will be doing more than ever before. Because when our Do-ing is inspired by our Be-ing, nothing feels heavy anymore. Everything flows smoothly and effortlessly. We are carried and guided by our Higher Selves so the total experience feels different. This may result (or not) in material wealth. But with no attachment to that wealth if we gain it. It is the attachment to things and the thoughts around them that creates the battles in Phase 1. When we release the attachments, we naturally float towards our center. I know what I want, but it is not appearing in my life. I keep getting stuff I don’t want. I keep getting situations, people and stuff in my life I didn’t ask for. What happens when I don’t desire anything? What happens when I (subconsciously) desire the wrong thing? And what about negative thoughts? Am I not asking too much? Don’t I give my Higher Self too much work? Maybe I better ask only for the most important things? I have already received many things that I wished for in the past couple of weeks, but not that what I asked for two months ago. What is happening? I am in my center and open and I still don’t seem to get what I want or at least not as fast as I want to have it. I feel quite overwhelmed and am inclining more towards a depression. I don’t have much energy. As a consequence my desires are pretty low or in other words I don’t care that much. I don’t feel much passion for anything. What can I do? Most of the “worldly” desires feel kind of meaningless to me, especially since I’m not playing the Phase 1 game anymore.